I am very excited about today’s post. It is the first in what I hope will be many – posts from authors of interesting papers describing the “Story behind the paper“. I write extensive detailed posts about my papers and also have tried to interview others about their papers if they are relevant to this blog. But Matthew Hahn approached me recently about the possibility of him writing up some details on his recent paper on the functions of orthologs vs. paralogs. So I said “sure” and set up a guest account for him to write up his comments and details of the paper. Well, we did talk about it later, and it turned out that although this claim is made in tons of papers, there is basically no data to support it. In the best cases a real example of one gene family will be cited, but there are very few of these. In the worst cases, the authors will just cite some random paper about gene duplicates (or Fitch’s original paper defining orthologs and paralogs). Of course I agree that patterns of sequence evolution might lead you to conclude this relationship was true, but there was no experimental data. Note – Toni Gabaldón was trying to post a detailed response but Blogger kept cutting him off with a character limit. So I have posted his response below. I appreciate the effort by Matthew Hahnn on explaining the story behind his paper on the so-called “Ortholog conjecture” and on facing some of the criticism. This paper attracted my interest as that of many others that work on or just use orthology. For instance it was chosen by one of my postdocs for our “Journal Club” meeting. And it was discussed during our last “Quest for Orthologs” meeting in Cambridge. I think is raising a necessary discussion and therefore I think is a good paper. This does not mean that I fully agree with the interpretation and conclusions ;-). I hope to modestly contribute to this debate with the following post. 1) What is the “ortholog conjecture”? Or in other terms, when should we expect orthologs to be more likely to share function than paralogs?. Always? Of course not. 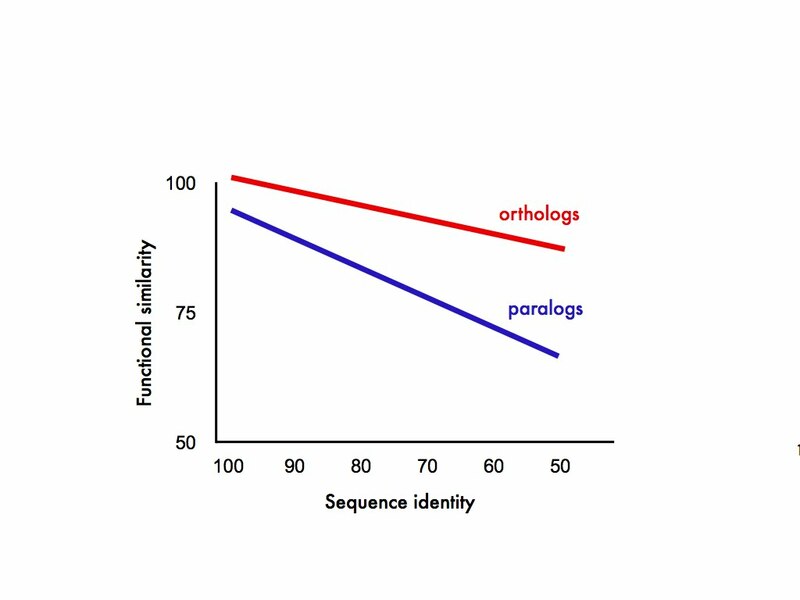 All of us would agree that two recently duplicated paralogs are likely to be more similar in function than two distant orthologs, so it is obvious that the conjecture is not simply “orthologs are more similar in function than paralogs”. In reality the expectation that orthologs are more likely to be similar in function than paralogs, as least this is how I interpret it, is directly related to the effect that duplication have on functional divergence. If gene duplication has some effect on functional divergence (even in not 100% of the cases), then, given all other things equal (divergence time, story of speciation/duplication events – except fpr the duplication defining the orthologs) one would expect orthologs to be more likely to conserve function. I think this complexity is not well considered (by many authors, in general). Hahn refeers to the famous review of orthology by Koonin (2005) as the source for the term “ortholog conjecture”. However, In that paper this conjecture is discussed always within the context of genes accross two particular species, whether in Hahn’s paper it is taken as well to other contexts. Thus, the proper context in which to test this conjecture is only between orthologs and between-species paralogs. As we can see, Red and purple lines in Hahn paper in figure2 do not show any clear difference. Secondly, Koonin was very cautions in his paper, stating that he was referring to “equivalent functions” and not exactly the same “function”, correctly implying that the functional contexts would be different in the two different species. This brings me to the next point. As Hahn founds, and it was anticipated by Koonin in that review, there is a huge influence of the “species context”, a big constraint of what fraction of the function is shared. Indeed I think is the dominant signal in Hahn’s paper. Why is that? One possibility is that the functional context determines the function, I agree. However, we should not discard biases in how different communities working around a model species define processes and function, also the type of experiments that are usually done. For instance experimental inference from KO mutants might be common from mouse, but I guess is not the case in humans (!!). I think this may be having a big influence and might even be the dominant signal in Hahns paper. Finally, one aspect which I think is fundamental is the notion of “divergence time”. Since paralogs can emerge at different time-scales they are composed by a heterogeneous set of protein pairs. Most of comparisons of orthologs and paralogs (Hahn’s as well) use sequence divergence as a proxy of time. However this is only a poor estimate, specially when duplications (as in here) are involved (we explored this issue in the past: http://www.ncbi.nlm.nih.gov/pubmed/21075746). This means that for a given divergence time paralogs may have larger sequence divergence than orthologs at the same divergence time, or otherwise (if gene conversion is playing a role). Is the conjecture based on sequence divergence or on divergence time?, I think the initial sense of using orthology to annotate accross species is based on the notion of comparing things at the same evolutionary distance. Thus basing our conclusions on divergence times might not be the proper way of doing it. 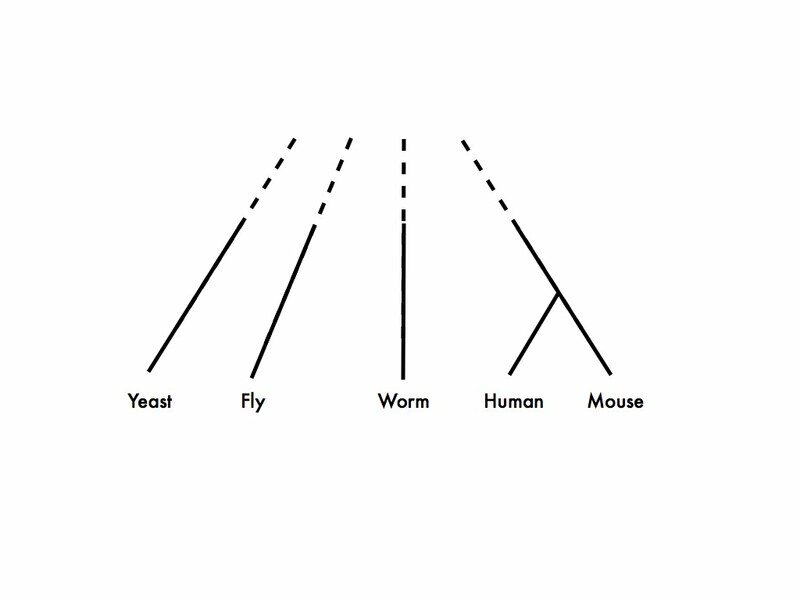 Therefore the notion of “accross the same pair of species” is important and thus only part of the comparisons made by Hahn and colleagues could directly test this. Looking at the microarray and between-species comparisons data, the conjecture may even hold true!! 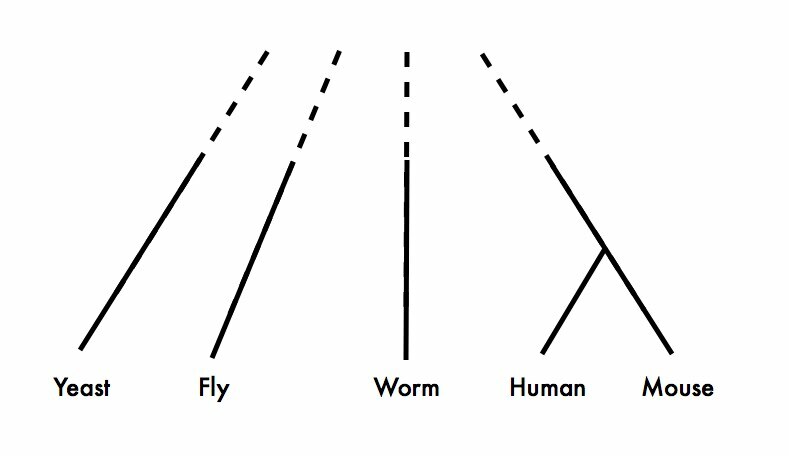 I, however, do think that the conjecture as stated above is limited and does not capture the complexity of orthology relationships. Indeed us, and many other researchers, are tuning the confidence of the orthology-based annotation based on whether the orthologs are one-to-one, one-to-many or many-to-many, even when orthologs are “super-orthologs” (with no duplication event in the lineages separating the two orthologs). When duplications start appearing in subsequent lineages thus creating one- or many-to-many orthology relationships, the situation is less clear. Following the assumption that duplications may promote functional divergence. Then one could expand the conjecture by “the more duplications in the evolutionary history separating two genes, the lower the expectation that these two genes would share equivalent functions”. Under this perspective, the real important hypothesis is that “duplications tend promote functional shifts”, I think this is based on solid grounds and has been tested intensively in the past. Arguably, this is also what I'd expect to be the main driver of the biological process ontology associations, since (as I understand them) biological process ontology terms typically reflect highly regulated and concerted activities at the “systems” level — i.e. highly contextual activities — not individual protein activities taken in isolation. The bottom line, for me, is the confusion (in the field generally) between protein sequence and gene function. The gene contains more than just the protein: it includes regulatory signals too, and we know that evolution of regulation is much more significant (certainly in more “complex” organisms) than evolution of enzyme function. OK – First. Thanks Matt for writing this all up. Second – I am only going to comment very briefly here b/c alas I have pneumonia and am hacking like crazy right now. I appreciate the effort by Matthew Hahnn on explaining the story behind his paper on the so-called “Ortholog conjecture” and on facing some of the criticism. This paper attracted my interest as that of many others that work on or just use orthology. For instance it was chosen by one of my postdocs for our “Journal Club” meeting. And it was discussed during our last “Quest for Orthologs meeting” in cambdridge. I think is raising a necessary discussion and therefore I think is a good paper. This does not mean that I fully agree with the interpretation and conclusions ;-). I hope to modestly contribute to this debate with the following post. I think this complexity is not well considered (by many authors, in general). Hahn refeers to the famous review of orthology by Koonin (2005) as the source for the term “ortholog conjecture”. However, In that paper this conjecture is discussed always within the context of genes accross two particular species, whether in Hahn's paper it is taken as well to other contexts. Thus, the proper context in which to test this conjecture is only between orthologs and between-species paralogs. As we can see, Red and purple lines in Hahn paper in figure2 do not show any clear difference. As Hahn founds, and it was anticipated by Koonin in that review, there is a huge influence of the “species context”, a big constraint of what fraction of the function is shared. Indeed I think is the dominant signal in Hahn's paper. Why is that? One possibility is that the functional context determines the function, I agree. However, we should not discard biases in how different communities working around a model species define processes and function, also the type of experiments that are usually done. For instance experimental inference from KO mutants might be common from mouse, but I guess is not the case in humans (!!). I think this may be having a big influence and might even be the dominant signal in Hahns paper. Finally, one aspect which I think is fundamental is the notion of “divergence time”. Since paralogs can emerge at different time-scales they are composed by a heterogeneous set of protein pairs. 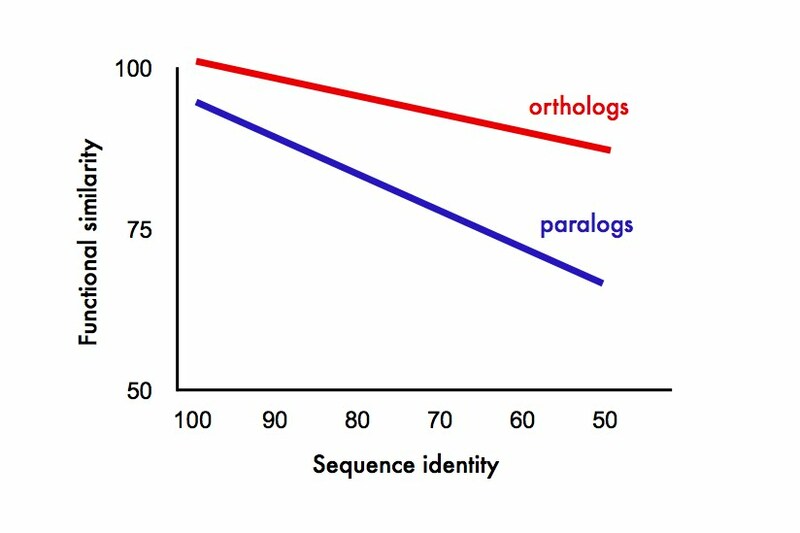 Most of comparisons of orthologs and paralogs (Hahn's as well) use sequence divergence as a proxy of time. However this is only a poor estimate, specially when duplications (as in here) are involved (we explored this issue in the past: http://www.ncbi.nlm.nih.gov/pubmed/21075746). This means that for a given divergence time paralogs may have larger sequence divergence than orthologs at the same divergence time, or otherwise (if gene conversion is playing a role). Is the conjecture based on sequence divergence or on divergence time?, I think the initial sense of using orthology to annotate accross species is based on the notion of comparing things at the same evolutionary distance. Thus basing our conclusions on divergence times might not be the proper way of doing it. Matt, yes – the trans-acting TFs can potentially be as important as the cis-acting promoter – but my point is that neither of these is directly determined by the protein sequence. I don't see how you can expect the protein sequence to have *any* direct predictive power about the transcription, and I think it's dubious to claim that any such correlation conveys much information. If you are seeing any correlation between protein sequence & transcription profile, it is presumably because of a mutual underlying variable in common (whether that variable is the promoter or the set of TFs in the genome). To do phylogeny on the protein sequence, then measure the transcriptional profile, then attempt to draw conclusions about “how much protein sequence tells you about function” based on these two observations (protein phylogeny & transcript abundance), is to completely ignore these hidden underlying variables (TFs and promoter). You may well observe a correlation, weak or strong, between protein phylogeny & transcription, but I don't see how you can draw a very broad conclusion about the connection between protein sequence and protein function on the basis of this. It would be like trying to describe the relationship between balls of wool and scratch-posts, without acknowledging the existence of cats. Just to clarify a point made by Toni: we did not take the ortholog conjecture from Koonin's 2005 paper. There are many papers that make the “orthologs are more conserved than paralogs” statement. Rather, I just liked the word “conjecture” and used it in my own way. Oops – comments collided. Yes, time is the underlying variable… Thanks for engaging so publicly in the discussion about this, btw. I agree more or less with Toni's synopsis. If people in the field are naively taking the ortholog conjecture the way that Matt suggests they are, then they aren't thinking at all about the underlying process of molecular evolution. For example, if a gene duplication mutation happened yesterday then one can expect that it would be functionally 'identical' to its parent gene assuming that the promotors/enhancers etc were all duplicated. In this case, an ortholog in an organism separated by 60 million years of evolution almost certainly MUST be more functionally divergent than the two in-paralogs. However, the excess capacity yielded by the duplicates provides the possibility of functional divergence to occur with time (subfunctionalization, neofunctionalization etc). Whether or not that happens is uncertain — there could be lots of essentially neutral duplications in genomes of individuals in populations that ultimately subsequently deleted over time or never get fixed. However, as the downward trend in funtional similarity in Matt's graph indicate when dealing with paralogs, time makes a big difference to the point where if one were to compare orthologs and paralogs at the same 'age' one does not expect to see the former as less functionally correlated than the latter. Romain, yes there is a correlation, but it is not hypothesized to be directly causal – rather, it is due to an underlying variable in common. (In your comment, citing Eugene Koonin's paper, you posit that the level of selection is the underlying variable: highly expressed proteins are under stronger selection. In my discussion with Matt above, we referred to time as the underlying variable: similar proteins tend to have similar transcriptional machinery and promoters.) Therefore, I maintain that you cannot use transcriptional evidence to “prove” anything about the link between protein sequence and protein function. In all cases observed so far (including the paper you cite), the hypothesis has always been common causality via a third variable, rather than direct causality. I also stand by the statement I made, that the actual mechanistic *control* of transcription has nothing to do with the protein sequence (even though the observed level of transcription may be *correlated* with the conservation of the protein, for various reasons). “duplications tend promote functional shifts”, I think this is based on solid grounds and has been tested intensively in the past. I just say that it has been tested many times not that the issue is completely solved. 😉 In any case, In our paper mentioned above we found an effect of duplications in terms of gene expression patterns across tissues (only one of the possible modes of functional divergence), we include some citations there of previous comparisons. There are some comparisons in terms of other types of functions or structure (see, for instance this comparison of strutural constrains betweeon ortho/paralo: http://www.ncbi.nlm.nih.gov/pubmed/19472362, or this on cellular localization: http://www.ncbi.nlm.nih.gov/pubmed/19930686). And there are many small-scale detailed examples, starting by the classical family of globins. You are right. I include myself into those that usualy do not explicitly express that distinction (never again! 😉 ). I considered enough to refer to Eugene's paper, and not reiterate everything again. I think most of the people do refer to that review, which is clear about the conjecture. But you are right in that this might not be enough and we should stress it more clearly. In general orthology-related terms and concepts suffer a lot of misuse and abuse. And I am already planning to be in Dublin for SMBE 2012–is there still time to propose symposia? I think that the way Matt just put the conjecture (Orthologs generally…)is indeed the way most people see it. And which has not yet been shown to be true. Yes, I think we can all at least agree to permanently banish the term “functional ortholog”! I am not really a GO fan, but we gotta have something, and it is not easy… I understand that the common procedure for systematic GO analyses is to discard the inferred ones right? (well, this is what I do, which doesn't mean it is right either)…so, only consistent annotations should be considered. I had never seen the Sonnhammer paper that Toni pointed to, and it's actually quite fascinating–inparalogs and within-species outparalogs are just as well-conserved (or more conserved) than orthologs in terms of domain architecture, at least for many millions of years after the splits. And then everything switches after that, with orthologs becoming more conserved. This actually reminds me of a paper from Andrej Sali's lab (http://www.ncbi.nlm.nih.gov/pubmed/19472362) where the same holds true for protein structure similarity–at more recent divergences paralogs are more similar than orthologs, and then the relationships flip. The problem is, I can't think of a good (biological) explanation for why orthologs are more similar at higher divergence levels. There is no reason to think that duplicates that have been around for many dozens of millions of years evolve any differently than “single-copy” genes. I agree with you. I like to fantasize that maybe epigenetics has something to do with this… well, who knows. I have read with interest this story, and went to the original paper to see if it is able to change my mind (from the “ortholog conjecture”). I have a couple of criticisms. For example, when you say “Moreover, one of the three major hypotheses for the maintenance of gene duplicates (subfunctionalization) does not require any functional change”, this is not completely correct. Subfunctionalization refers to the spread of ancestral functions between gene duplicates, i.e. there is functional change in both (subfunctionalization, of course, can take place just by shifts in gene regulation, not at the protein level, what would be similar to what you said). Regarding the long-term process, in-paralogs will be never be out-paralogs for the analyzed species… they will become out-paralogs only if the species containing them diversifies in other species… So, I do not see the problem.